They were giving up corporate, chasing after the power and prestige, and opening up their own little “mom and pop” kind of shops once again. Most are growing or making their own products. They are loving it and having a fulfilling life. This was a very good article but this opening sentence, along with the title, “The New American Dream,” got me to thinking again about some of those age-old questions for all of us…. What were you born to do? What do you need to return to so you can live the life you were designed to live? What dreams do you have and how will you live out those dreams? What is causing you to simply get through life rather than live a life? Many of these people risk everything they had financially to make it work. At the time of the article being written, some still did not know if it would work, but they really didn’t care. They would figure something out to continue in some fashion this new life of freedom for them, and fulfillment in baking, building, or growing their own unique twists. They were creating in many ways, but more than that they were alive with energy to face the day and see what exciting thing might happen. They looked forward to constructing a new piece of furniture or baking a unique dessert. They wanted to accomplish so much more than “success.” We often talk about it but life should not be about success as we define it in North America, but it should be about significance and the difference we can make. Success-It is about you and what you accomplish. Significance– It is about others and how you can make a difference in lives of others. Life is not about you; it is about beyond you. What will you leave behind that will help others? How do you need to think differently? 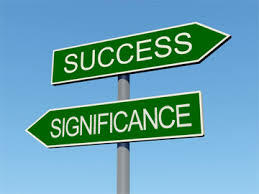 What steps do you need to take to live that life of significance? What is it that you are good at and helps you live the life you were designed to live? What energizes you and helps you live a life fulfilled?